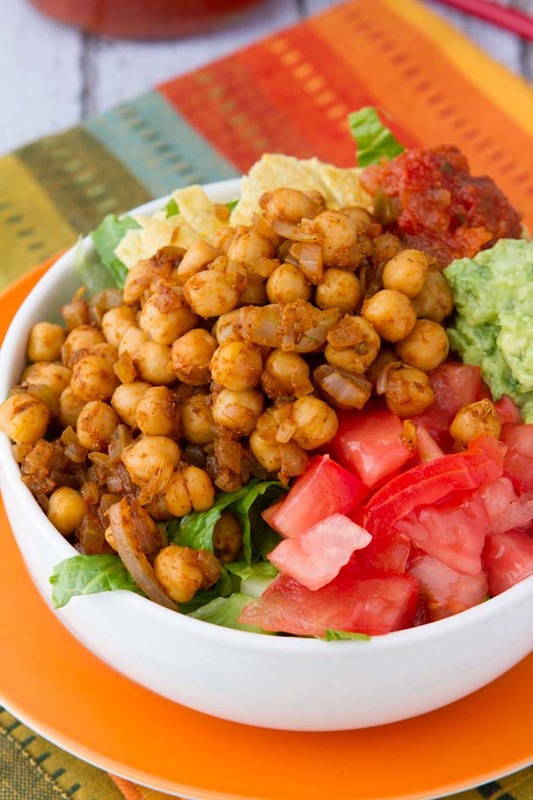 A healthy, homemade, quick and easy vegan taco salad recipe. Made with chickpeas instead of nuts, seeds or soy. Add sliced onion and water to a medium-sized saucepan. Heat on medium-high heat for 2-3 minutes, until onions are softened. 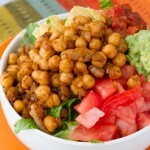 Add chickpeas and taco seasoning and reduce heat to medium. Cook uncovered for another 2-3 minutes, until heated through. Meanwhile, add guacamole ingredients to a small bowl and mash with a fork to combine. Set aside. Pile all of the salad ingredients in a bowl. Top with guacamole and taco “meat”. This recipe serves 1 person. Feel free to double up on the recipe if you need to feed more. I used chickpeas because they hold well together when pan-frying. Feel free to use whatever you have on hand. Edamame may be really good, too!